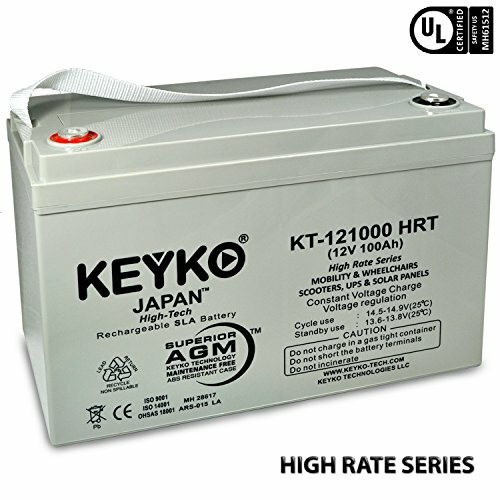 UL Recognized HRT High Rate Series Deep Cycle Replacement Battery 12 Volt 100 Amp is Manufactured with the Highest Standards to Provide Extreme performance. High discharge Rate - Robust Construction Design - Wide Operating Temperature Range, and long Lasting Expected Service Life - Floating time range 3 to 5 years. Valve-Regulated Lead Acid (VRLA) Technology for Safe operation in any position. Replace any brand and fit perfectly any device with this same capacity: CASIL CA121000 POWERSONIC PS-121000 UPG UB121000 12FM7.5 RHINO SLA7.5-12. Check all Product details and Product description below for more details.